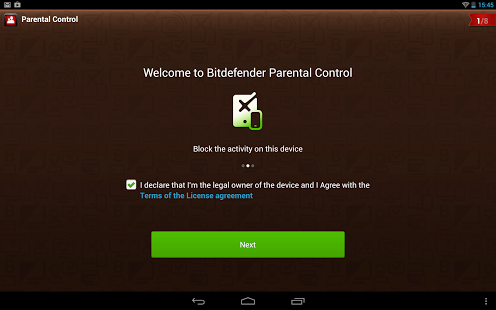 Bitdefender Parental Control for Android is a key part for Parental Control suite. The Bitdefender Parental Control needs to be installed on your child’s mobile phone. To use Bitdefender Parental Control, you must link your device to a MyBitdefender account by logging in to the account from the app. If you don’t have an account, choose to create a new account using the corresponding button. As a parent, you can see all the reports and create blocking rules in the Parental Control online interface. You just have to login to this page: http://bit.ly/YOotqI with your MyBitdefender credentials, and to create a profile for your little one. 1. Link your phone/tablet to MyBitdefender to see all the reports and create blocking rules in the Parental Control online interface. 4. Tap Accept to finish the installation. You’ll be updated on everything from new friend requests, comments, pictures, and videos, to changes in privacy settings. If you having a hard time reaching your kid, you can always check his location to make sure he’s in a safe area. Knowing where he is helps you stay worry-free. With Bitdefender Parental Control, you have the ability to block suspicious contacts on your kids’ mobile devices. Bitdefender Parental Control allows browsing only during the hours set by you. It also allows you to block apps and/or websites, so you’ll know your kids will be safeguarded while on the Web. Now, we are tracking the Android`s default browser and Chrome activity. For a complete protection, you have the possibility to block from the beginning of the installation the access to other browsers from your child’s device. Also, you can visit your MyBitdefender account, apps section, and choose your apps. To learn more about how to protect your kids from digital threats, please log in to your Mybitdefender account: http://bit.ly/YOotqI or create an account if you don’t already have one. Use Bitdefender Parental Control to block content that may be offensive or inappropriate for your kids, restrict Web access between custom-set hours, and remotely monitor all online activity – even on Facebook. Hello Heather! We value your feedback and would like to know more about the problems that you are experiencing.Please send us more details on: bdparental@bitdefender.com and we will answer you as soon as possible. Thank you! Something missing I bought Bit Defender Total Security 2013 a week ago. Thanks for this parental control app. But to view my dashboard every time i need to login to your website. This is somewhat irritating. Please make an app so that I can view and manage my dashboard easily through that app instead of browser. This would really help. Hope you guys are listening and make a password protected app as mentioned. Rest all is perfect. TY. Hello Makayla, Don’t be mad on your parents, we’re sure that they installed the app only because they care about your safety. Feel free to talk with your parents about this. You should feel more protected now. We wish you all the best.